The Rosenberger SMP spectrum contains an innovative coaxial series of PCB connectors to enable multifunctional board-to-board connections. The latest innovation in this family, the SMP Infinity connector series, realises a wide range of applications of up to 40 GHz. 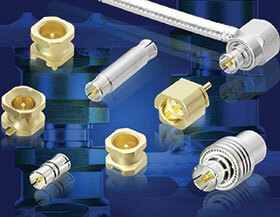 The product portfolio includes one-piece connectors with pre-assembled inner conductors. The range of connectors includes cable connectors, straight and right-angle connectors, PCB connectors (pin-in-paste), solder pin, surface-mount, rear-mount type, bulkhead connectors, test adaptors and cable assemblies. SMP Infinity is underpinned by a one-step locking mechanism, which guarantees a low insertion force and easy implementation. It has minimised dimensions (40% smaller than standard SMA screw types) to accommodate minimum board-to-board distances, while still delivering high-power connections. It requires only one tool for horizontal and vertical disconnecting, and offers fast and easy disconnection despite high retention forces. Technical specifications of the SMP Infinity connectors include a return loss above 25 dB from DC to 15 GHz, and above 18 dB from 15 GHz to 40 GHz; low retention forces (no more than 45 N); more than 500 mating cycle durability; and a temperature range of -65°C to +155°C.